On a weekday morning in the Tanzanian village of Mkutani, a group of children are wandering down a dusty path more than a mile from the schoolhouse they should be sitting in. But it is not the lure of fun and games that has drawn them away from school today; it is their families’ need for water. At the end of their two-hour journey, they will arrive at a well, fill their buckets, and begin the long walk back to the village, their studies now just an afterthought. The lack of a water source near the Mkutani schoolhouse severely impacts quality of life for the village’s children. 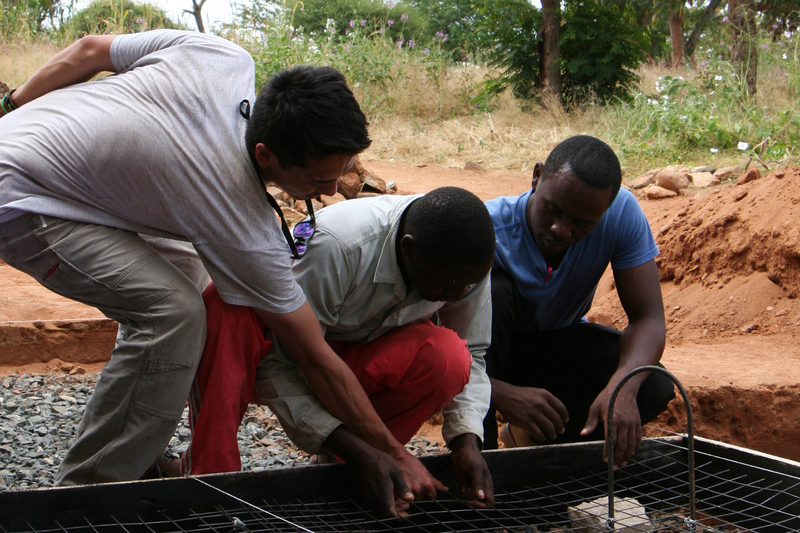 Working with Tanzanian school officials, students in the Harvard John A. Paulson School of Engineering and Applied Sciences (SEAS) chapter of Engineers Without Borders USA tackled this problem during a yearlong project that culminated in a summer work trip. 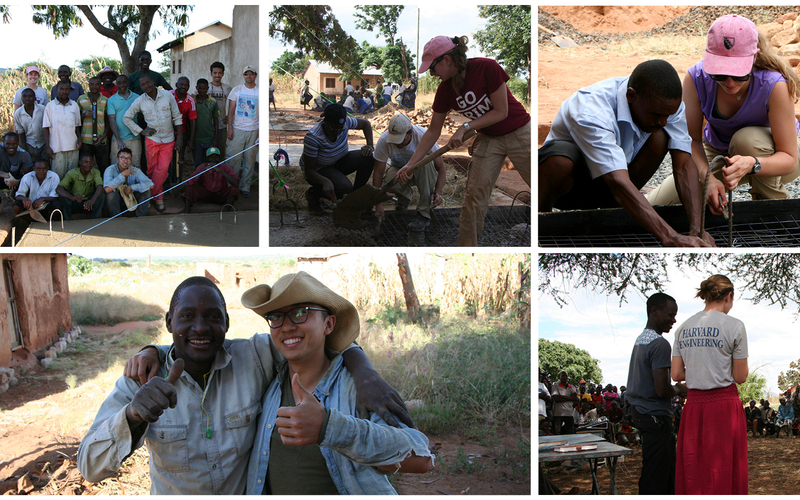 The students spent the academic year designing a water catchment system to collect rainwater from the schoolhouse roof and store it in tanks, providing a safe, clean, and accessible water source. Their ultimate goal is to improve education outcomes through engineering infrastructure, Trenchard explained. In Mkutani, water and education are closely intertwined. The more classroom time children miss to fetch water, the less likely they are to pass a high-stakes exam all Tanzanian children must take after seventh grade. Students who fail are not permitted to enroll in high school. The lack of clean water at the school has an outsized impact on female students. Leveling the educational playing field is a major priority of community members in Mkutani. Drawing on input from community leaders and school committee members, more than 30 students collaborated on the water catchment project during a SEAS course taught by chapter advisor Christopher Lombardo, Associate Director for Undergraduate Studies in Engineering Sciences. The team first sought to ensure that the project scope met student and community member needs, a process that started in Mkutani in 2017 and continued remotely throughout the year. The group continued to collect feedback throughout the design process, soliciting community preferences on everything from the start date of construction to the location of water spigots to the number of tanks installed at each building. 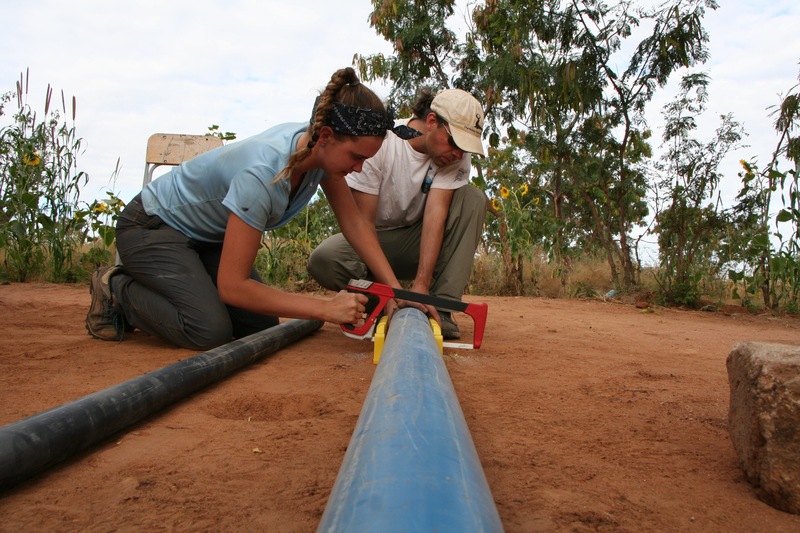 But before they could even think about tanks and pipes, the EWB team had to understand rainfall in Tanzania. They teamed up with professional engineer mentors to study rainfall patterns and created a model to predict how much water their system could capture. Avery Meyer, Alfred Kwayemba, and Daniel Getega, S.B. ’19, install wire mesh that will serve as internal stability for the concrete slab at the New Schoolhouse. They crafted a detailed plan to install roof gutters and seven rainwater collection tanks, designing a system of prefabricated tanks connected by piping so water levels and pressure balance out. After drafting a bill of materials to guide the cost estimate and pre-trip shopping, the travel team took off for Tanzania and dove into the implementation phase. Once on the ground, one group prepared the construction site in Mkutani, while another drove to the nearby capital city of Dodoma to buy materials. For instance, some pipe diameters called for in the plan weren’t available, construction materials were available in an inconsistent mix of imperial and metric measurements, and the tanks that were delivered were wider than the ones in their drawings. They troubleshot each problem as it cropped up, and tweaked their design to fit the parts they were able to purchase. 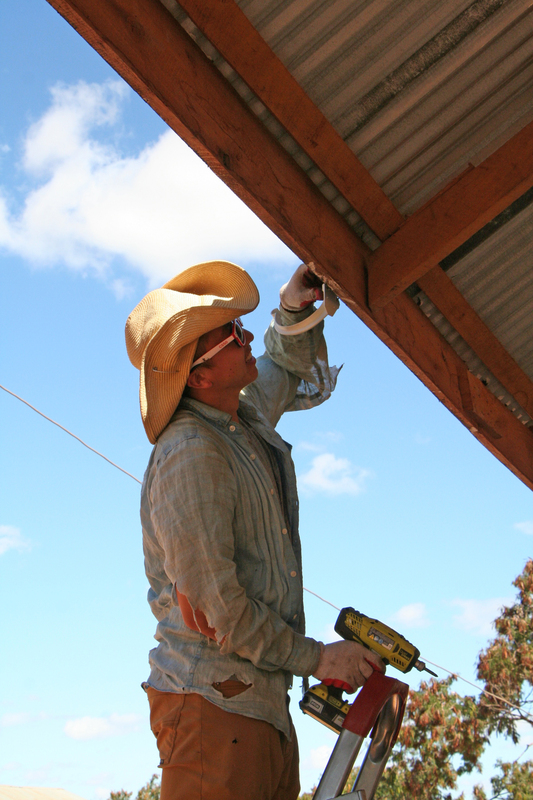 Back at the worksite, the construction process also met its share of challenges. With no way to keep vertical support rods in place, the team rigged up a solution with rope and counterweights using rocks and bricks. Worried that manually mixing concrete for the tank foundations would be too slow, they hired a concrete mixer. 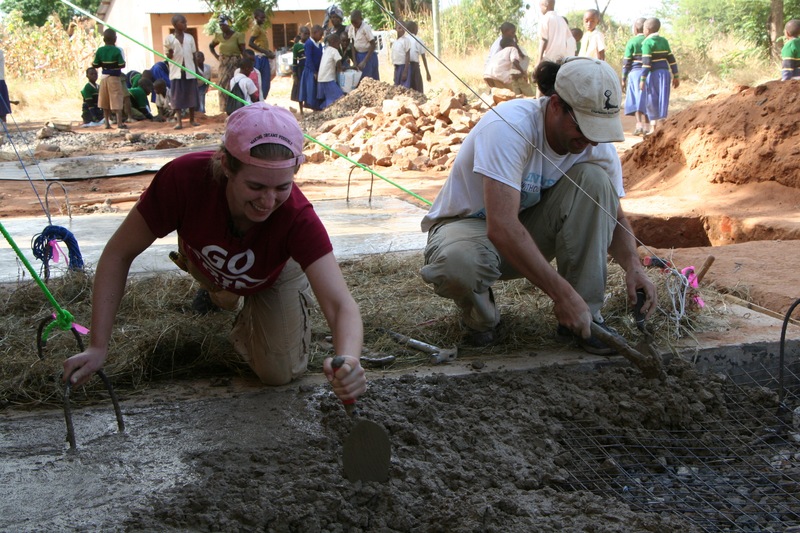 The students worked alongside several community members who were instrumental as they measured out areas for each tank, poured concrete slabs, installed the tanks and roof gutters, and connected all the components. 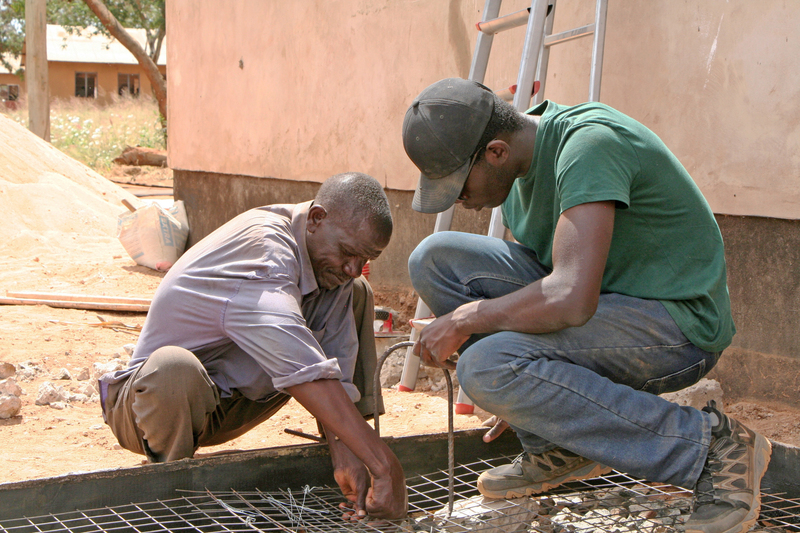 Working with the community members had an added benefit—six people in Mkutani can now install tanks on their own, so the community could expand the system in the future. At the end of three weeks of hard labor, the students had installed a system of seven, 8,000-liter storage tanks that should collect enough water to last for nine months in an average year. On the last day of their trip, grateful community members presented the team with a goat as a gift, and they feasted together in view of the finished project. Back in the U.S., the students will spend some time parsing through the information from the trip and making sense of it all, Trenchard said. They aren’t sure what the future holds for their next project in Mkutani, but will keep in touch with the community to see how they can best work together to keep improving education. Their work has already begun to have an impact. In 2016, the Harvard students arrived in Mkutani as community partners for the first time to assess future project work, and last year, they built a residence so teachers could live near the school and spend more time helping students prepare for their seventh grade exam. Nine Mkutani students passed last year’s exam—the highest number in recent memory—and seven of those students are girls. Those results show Trenchard that the hard work they have poured into the village was well worth it.